Amazon's tablet is almost ready to launch. If you believe TechCrunch, who claims to have used a near-final version of the device, it runs Android but has almost nothing to do with Google. It's all about Amazon. And it'll be all over the place inside of two months from now. As the story goes, the tablet will be called Amazon Kindle, has got a 7″ capacitive touch color display, will come with a Amazon's Prime service – including Amazon Instant Video access – and will be available in late November for $250. Apparently Amazon is also working on a 10″ tablet and an e-ink/LCD hybrid device, but the plan now is to launch a single model for this holiday season. TechCrunch lists a bunch of specifics, including what they believe to be a two-point multitouch display (as opposed to iPad's ten-point system), and a single-core processor and relatively small amount of internal storage under the hood. These kind of specs won't make the fanboys sing, but combined with that low price tag, tie-in to Amazon perks, and the company's near ubiquity in the online retail game, there's good reason to believe this thing's gonna be a hit so long as it works decently well. Which, apparently, it does. We've been saying that for awhile, ourselves: This isn't about specs, it's about everything else Amazon can offer. But the key for Amazon is just how deeply integrated all of their services are. Amazon's content store is always just one click away. The book reader is a Kindle app (which looks similar to how it does on Android and iOS now). The music player is Amazon's Cloud Player. The movie player is Amazon's Instant Video player. The app store is Amazon's Android Appstore. Google's Android Market is nowhere to be found. In fact, no Google app is anywhere to be found. This is Android fully forked. My understanding is that the Kindle OS was built on top of some version of Android prior to 2.2. And Amazon will keep building on top of that of that over time. In other words, this won't be getting "Honeycomb" or "Ice Cream Sandwich" — or if it does, users will never know it because that will only be the underpinnings of the OS. Any visual changes will be all Amazon. There's a Cover Flow-style carousel for navigating apps and documents, a dock, and a status bar/notifications drawer. There's a WebKit-based browser. And there's a ton of Amazon-themed customizations that apparently tie into the forthcoming Amazon.com redesign rather tightly. This is going to be huge. 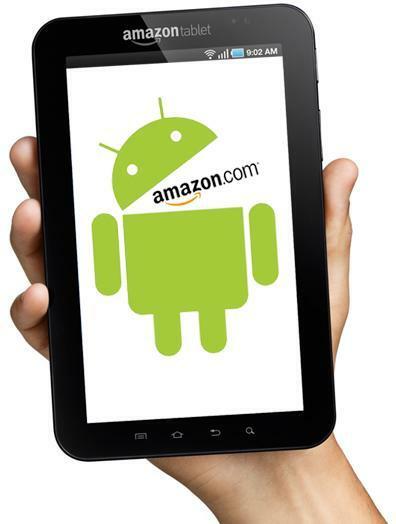 We've been betting on that since we first heard about an Amazon tablet. And you know how tech blogs are prone to getting caught up in their own hype. But, honestly, I think this is going to be pretty big. And if it is, reports say, there's a 10″ version with a more powerful (possibly dual-core) processor waiting in the wings for launch early next year. Many more details over on TechCrunch.